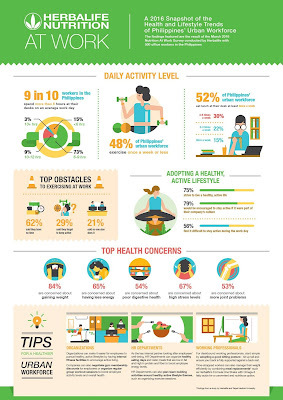 The survey findings reveal that almost nine out of 10 (85%) workers in the Philippines spend at least six hours a day sitting at their desk, with 52% of its workforce eating lunch at their work desk two to five times per week. 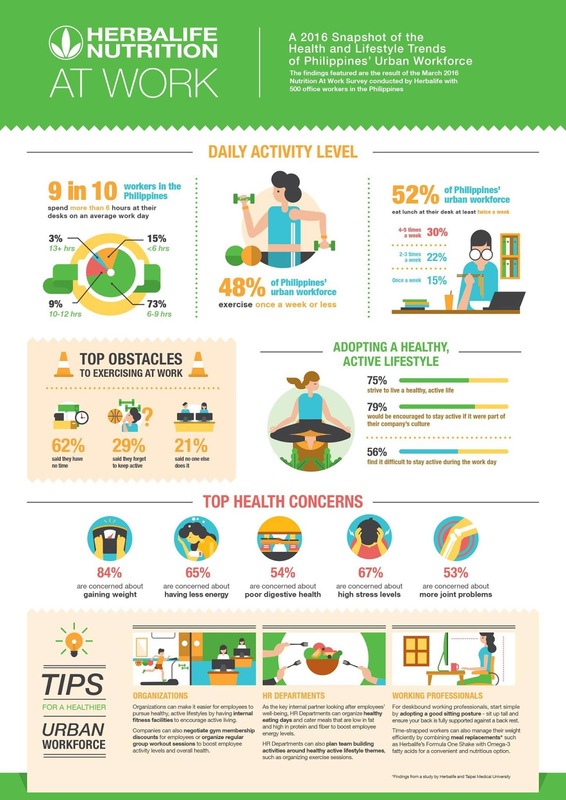 Moreso, it is appeared that majority of Philippines’ workforce (86%) exercise less than three times per week, with five out of 10 getting less than 30 minutes of physical activity a day at their workplace. This suggests a significantly worrying trend locally, on the back of rising obesity rates recorded in recent years. Herbalife launched its fifth Asia Pacific Wellness Tour 2016 to address health issues associated with sedentary lifestyles, and deepen practical understanding on the benefits of a healthy, active life. Held in the months of April and May, the fifth edition of the Wellness Tour builds upon the successes of the past four tours that welcomed more than 80,000 participants across the region, and features a host of medical symposiums, talks and workshops led by seven experts from Herbalife’s Nutrition Advisory Board (NAB), covering 26 cities across Australia, Cambodia, Hong Kong, India, Indonesia, Japan, Korea, Macau, New Zealand, Philippines, Singapore, Taiwan, Thailand and Vietnam. Dr. Julian Alvarez Garcia, a specialist in sports medicine and sports physiology who has advised professional teams, national teams and individual athletes on a range of disciplines including weightlifting, triathlons, mountain biking, football and basketball. Dr. Darren Burgess, an expert in sports science and nutrition who has authored papers in multiple peer review journals. He is also the current Head of High Performance at Port Adelaide Football (AFL) Club, and the former Head of Fitness and Conditioning at Liverpool Football Club. Herbalife is a leading nutrition and weight management company that has been supporting healthy, active lives since 1980.